With “This Wide Night” Anton’s Well Theater Company continues to assert its claim to be one of the finest art theatre companies in the Bay area. Their Bay area premiere of Chloë Moss’s brilliant play about the friendship between two women who served prison time together (winner of a Susan Smith Blackburn Prize) is nothing short of extraordinary. Moss is a language playwright, like her obvious peers Harold Pinter and David Mamet. She tells her story in a torrent of words, utilizing an elliptical, mysterious vocabulary, and often engaging repetition and sound in ways that move the script into purely poetic territory. Like Pinter, she plays her cards very close to the vest. Although we are riveted by these fascinating women and their histories, we can never be quite sure of the details of their stories and are left to wonder and admire. The result (as intended, I’m sure) is more “slice of life” than story telling, and it is uncannily real. Like Mamet, her language sounds like the musical explorations of a master percussionist. It pounds and astounds. This level of playwriting makes remarkable demands upon the actors, who have to suggest complex inner lives and histories, without ever revealing specifics. It is a style which is difficult to achieve, requiring intense and focused rehearsal by highly skilled performers under the guidance of a master director. Marie (Miia Ashley) is resting in her bed sitting room when she hears an unexpected knock at her door. It is her friend Lorraine (Mary Jo Price), a woman whom we quickly learn was once imprisoned with Marie and has now found her on the outside. Marie is hesitant to welcome Lorraine into her life, but Lorraine is persistent and soon the two women have made a home together. Little happens. They talk, and as they talk, the relationship deepens into a remarkable friendship and we learn to love and appreciate their special characters and affection for one another, only gradually piecing together the details of their past, and never with great clarity. They talk. They explore their friendship. We watch and listen. For nearly two hours, time seems to stop as we are carried through a full range of emotions. By the end of the evening, the catharsis achieved is remarkable. The experience was an emotional marathon. Rarely does empathy receive a workout like this! It may be that this review is confusing. This is the sort of theatre that needs to be experienced and can barely be described. But if you care about good theatre, good writing, and good acting, you really ought to attend. 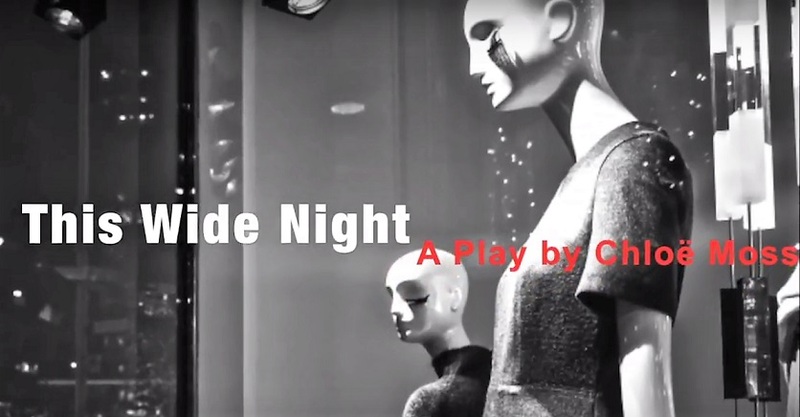 “This Wide Night” plays at The Berkeley City Club through December 17th. For further information, click here. “This Wide Night” by Chloë Moss, presented by Anton’s Well Theater Company. Director: Robert Estes. Assistant Director: Wm. Diedrick Razo. Lighting Designer: Bert van Aalsburg. Costume Designer: Nikki Anderson-Joy. Fight Choreography: Jon Bailey. Music & Sound Design: James Goode. Marie: Miia Ashley.Lorraine: Mary Jo Price. Posted in Reviews.Tagged Anton's Well Theater Company, bay area san francisco theater reviews, Charles Kruger, Chloë Moss, Mary Jo Price, Miia Ashley, Robert Estes, This Wide Night.